3. CHRYSOCHLAMYS Poepp., Nov. Gen. Sp. Pl. 3: 13, t. 211. 1845 . Tovomitopsis Planch. & Triana, Ann. Sci. Nat. Bot. sér. 4, 14: 261. 1860. Shrubs or trees; latex often milky white or yellow, sometimes clear or inconspicuous. Leaves opposite; secondary veins widely spaced, sometimes forming a partial submarginal vein. Inflorescences cymose panicles, rarely reduced to 1-3 flowers, mostly terminal. Flowers unisexual (plants dioecious). Sepals 4-6, imbricate in bud; petals 4-6, white, imbricate. Stamens numerous (25-200); filaments of fertile stamens free (the innermost ones sometimes fused and their anthers reduced or abortive). Ovary (4)5(6)-locular, 1 ovule per carpel; style short or lacking; stigmas expanded. Fruit a leathery or fleshy capsule, white to reddish. Seeds 1-5, 1 per carpel, enveloped in part by a fleshy white or orange aril; cotyledons minute. Mexico, Central America, Lesser Antilles, Colombia, Venezuela, Guyana, French Guiana, Ecuador, Peru, Brazil, Bolivia; ca. 50 species, 5 in Venezuela, 3 of these in the flora area. In the original description of Chrysochlamys clusiifolia Maguire [Bol. Soc. Venez. Ci. Nat. 25: 225, pl. 1. 1964 = Dystovomita clusiifolia (Maguire) D'Arcy], Bernandi 2821 (NY) is cited, "purported to be from Bolívar, Río Icabarú at 450-850 m." Given the tentative nature of the citation and the fact that no material was seen from the flora area, this species is not included in the following account. This genus is in need of revision, and the names treated below should be considered tentative identifications for the flora area material. 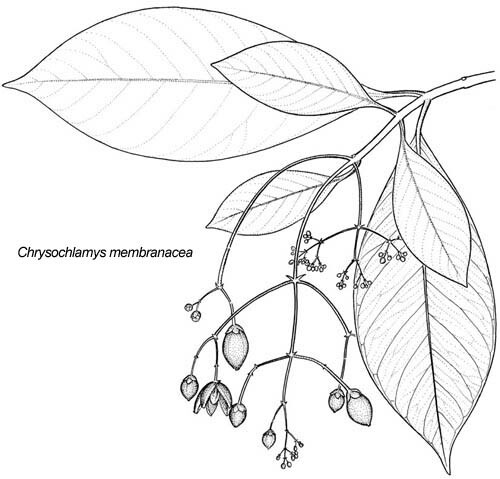 Chrysochlamys membranacea Planch. & Triana, Ann. Sci. Nat. Bot. sér. 4, 14: 260. 1860. -Tovomitopsis membranacea (Planch. & Triana) D'Arcy, Ann. Missouri Bot. Gard. 67: 1034. 1980. -Coloradito, Uacayamuiyé (Pemón). Shrub or small tree 2-5 m tall, with stilt roots. Lowland and basimontane evergreen forests, 100-500 m; Bolívar (1 km below Araguaña on upper Río Caura, Caño Michaquena off Río Caura, base of Cerro Guaiquinima, Salto Pará), Amazonas (2 km from La Esmeralda, Río Mawarinuma). Apure, Aragua, Barinas, Carabobo, Distrito Federal, Lara, Miranda, Sucre, Yaracuy; Colombia, Guyana, French Guiana, Ecuador, Peru, Brazil. Fig. 183. Chrysochlamys pauciflora Steyerm., Fieldiana, Bot. 28: 386. 1952. -Wacamiyek (Arekuna). Shrub 5-8 m tall. Montane streamside forests, 900-1100 m; Bolívar (Quebrada Oparumá near Kavanayén). Endemic. This species is known only from the type collection and was not examined for this treatment. The name may belong in synonymy under Chrysochlamys weberbaueri. Chrysochlamys weberbaueri Engl., Bot. Jahrb. Syst. 58(Beibl. 4): 8. 1923. -Wacamiyek (Arekuna). Tree to 5 m tall. Evergreen lower montane forests, 100-1000 m; Bolívar (Macizo del Chimantá [Abacapá-tepui], Serranía Marutaní), Amazonas (Cerro Duida, base of Cerro Marahuaka, Río Baría, Simarawochi). Colombia, Guyana, Ecuador, Peru, Brazil, Bolivia.